We often get the question, "What is Co-Ownership?" It’s simple! We co-own practices with veterinarians, letting them treat patients and provide local leadership, while we handle all the business functions, including but not limited to: marketing, finance & accounting, operations, HR, and recruiting. Dr. Goodvet partners with VPP. She gets upfront cash for selling a portion of her business that reflects current market value and VPP gets to work immediately, and she has more time both in the exam room, and outside the practice. Dr. Goodvet can continue to practice medicine like she always has (with way fewer management worries!) while still enjoying profit distributions as a co-owner. 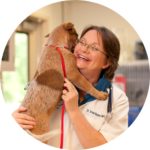 VPP assumes responsibility for managing the business on day 1 of partnership, removing day-to-day business burdens that keep Dr. Goodvet from her patients. Dr. Goodvet continues to share in the practice growth until she is ready to retire on her own timeline (2 years? 20 years?) without worrying about what will happen to her hospital and her staff. Whether you’re a mid-career veterinarian feeling a little burned out, an associate looking for a path to ownership, or a seasoned-vet nearing retirement (especially with an associate interested in ownership) , co-ownership might be the right option for you. Want more info? Let's Chat! "The owner is always on the hook for whatever comes up at the clinic. For years, it was just me juggling clients, staff, and trying to get some time at home. VPP ALWAYS HAS MY BACK AND I GET MORE TIME WITH MY FAMILY." You didn’t go to vet school to run payroll, design marketing programs, or run reports. With VPP’s help, you can get back to practicing medicine without having to worry about running the business. We work closely with our hospitals to elevate their marketing while honoring their unique identities. VPP’s energetic team ensures our client retention numbers are some of the best in the biz. Don’t spend any more time pouring over resumes or working through benefits issues. Our team has deep experience working through all types of personnel questions. VPP provides comprehensive back-office support, coupled with the financial analysis and insights you need to make better decisions for the health of your practice. We provide the extra set of hands that helps you and your practice manager deal with life’s fire drills as well as your hospital’s bigger projects.